On Friday June 8, John and Anthony visited zip code 01748 in Hopkinton, Massachusetts. 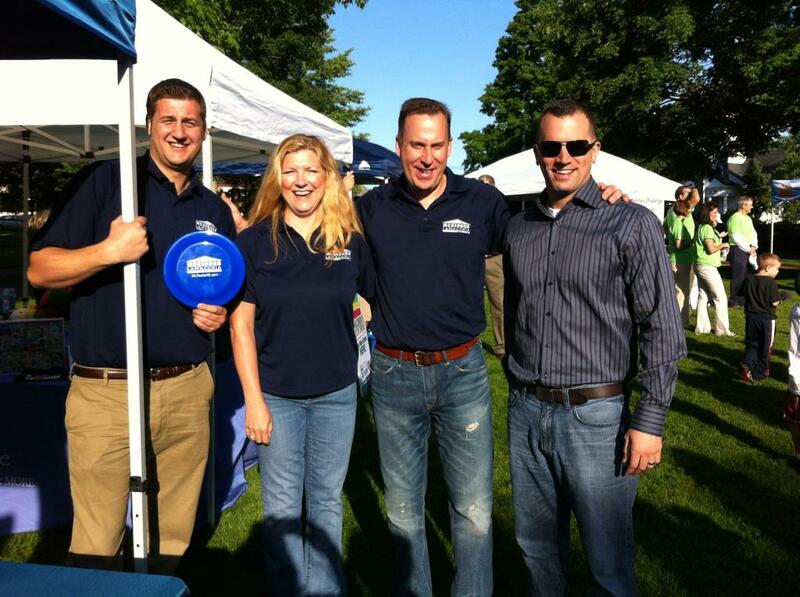 John McGeough, Anthony Lamacchia, Ellen Archambault, and Adam Pasciscia were in Hopkinton at the Town Common with the team at FOX25 Morning News. John and Anthony discussed 3 featured properties for sale in Hopkinton. Welcome back to Hopkinton everybody as we continue our Zip Trip this morning from the lovely town green here and we’re looking on the market this morning and I’m joined by John McGeough and Anthony Lamacchia of Lamacchia Realty thanks for being with us today. Thanks for having us, as always. Well the way this was going I thought we were in trouble! It was a bit of an ugly week but today there’s a blue sky and we’re very happy to have it. It was driving in today, but it’s a lovely day to talk a little about real estate here in Hopkinton you guys have brought along three lovely properties that you want to talk about who’s starting us off? I’m going to: we’re going to talk about Cobbler’s Way, it’s actually a bunch of properties , it’s 9 homes on a 33 acre parcel of land it’s a new development they’ve got 3 of them built so far they are 5000 square foot, homes brick construction, 2 car garage, 5 bedrooms, 3 and a half bath, heated and cooled by Geo Thermal energy. You might want to ask John that I think he knows more! Basically it gets the energy from under the ground and brings it up into the house and it heats and cools the house. It’s substantially cheaper; your utility bills are much less –that’s all people care about. You get a tax break on the money you spend on it. It’s really amazing technology, and these homes all have them. They’re built by a great builder and it’s a real wonderful development, Cobbler’s Way. And all of them custom built for the owner? There’s going to be 9 homes and they’ve built 3 so far, there’s what, 6 left! They’re priced between 1.2 million and 1.5 million. All right, so not cheap. But if you’re in the market for a custom home and you want to sort of make your decision on what’s in your house: your fixes, your finishes, that might be the spot for you. This is definitely the place, real nice homes. Ok let’s talk number two are you going to do this one for us? Yeah, this is going back once again in time, this home was built in 1785, it’s 152 Hayden Rowe, so it’s your classic large expanded Colonial, you’ve got all the column work, it’s just a lovely classic, very period home. The nice part is it’s huge as well. Very similar to the new development, it’s 5000 square feet, it’s got 3 and a half baths, 5 bedrooms, so it’s a beautiful, beautiful home and it’s on for $799,000 and the average price point in Hopkinton is rather high, it’s over half a million dollars so both of these opportunities are great buys. As it turns out we only have about 30 seconds can you do the last one in 30? This one, once again, under $800,000, it’s $790,000, 13 Cedar Street Extension, about 6 years old, wonderful Colonial, under 4000 square feet, 2 car garage and an awesome fire pit. Can’t beat it. Can’t get that in the city! No you can’t! All right you guys that is a look at some of well a little sampling of the real estate here in Hopkinton John McGeough and Anthony Lamacchia we appreciate you being here as always! The town of Hopkinton is best known as the start of the Boston Marathon, when 30,000 runners arrive at the town common. The rest of the year the population is about 15,000, an increase of 63% from the population in 1990. Hopkinton is conveniently located near the Mass Pike and route 495 so it’s a short commute to Framingham and Marlborough and less than an hour to Boston. You can also get to Boston via the Framingham commuter rail, in nearby Southborough. Several companies have their headquarters in Hopkinton, including the data storage company, EMC. What makes Hopkinton a great town to live in? Hopkinton was named one of the best places to live by Boston Magazine in 2011. This quiet community has plenty of green spaces and outdoor activities for the whole family. Hopkinton State Park and Whitehall State Park both offer swimming, hiking trails, fishing, and boat rentals. EMC Park has a skateboard park, baseball fields, and playgrounds and is a great place for both toddlers and for older kids. Hopkinton schools are some of the best in the state. In fact, Hopkinton High School has just been named one of the top 100 public high schools in the state by U.S. News & World Report and was also awarded their Gold Medal for student mastery of college level material. Hopkinton also has an active arts community. The Hopkinton Center for the Arts provides workshops, art exhibits, lectures, plays and other creative activities for residents. And since 1974, Hopkinton has hosted the PolyArts Festival in the town common. This fun free event has something for everyone: crafts, food, music, and entertainment. It’s a great opportunity for local artists to showcase their work. There are currently over 100 single family homes for sale with an average list price of about $655,000. And there are currently 21 condos for sale with an average list price of $330,000. Interested in moving to Hopkinton? Search for homes in Hopkinton. Greetings from a Hopkinton resident! (source: HCAM – Mike Torosian). Enjoy. Have a great day in Hopkinton! Do you live in Hopkinton? Tell us what you like most about Hopkinton or send us your photos!